Bags under eyes are very common among people of both sexes, even though they seem to bother women more than they do men. As a person gets older, the chances of occasionally having bags under eyes are higher, due to various factors. With age, the muscles that support the eyelids become weaker, just like other muscles in other parts of the body. Due to that, the fatty tissue, whose purpose is to support the eyes, migrates forward, into the lower eyelids, causing a puffy and swollen appearance. Bags under eyes are not a health issue but they often pose a significant cosmetic concern. They can be reduced with cold compresses and other home remedies, and in cases when they are particularly persistent or large, there are cosmetic treatments and procedures available. 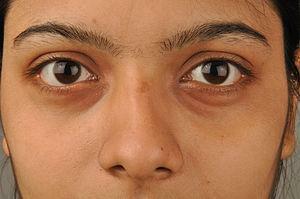 Bags under eyes include swelling, especially in the lower eyelid, saggy and loose skin and dark circles below the eyes. The eyes may get particularly puffy in the morning, upon waking up, as well as in the evening, after a long day. Swelling also tends to become worse after crying or after exposing the eyes to pollutants and irritants. Bags under eyes are usually completely harmless, but if they are accompanied by redness, itching, pain and irritation and if the swelling appears on other parts of the body too, it is recommended to see a doctor. As for the causes, weakening of skin and tissues around and under the eyes is the main cause. In addition, the area below the eyes may accumulate fluids, due to various factors such as hot and humid weather, lack of sleep, sleeping on the back, allergies and heredity. People who are very concerned or annoyed about the bags under their eyes can choose one of the many options available for this cosmetic problem. There are creams and lotions, serums and other cosmetic products, designed to solve the problem with bags under eyes. Many of them are easy to use and relatively cheap. There are also surgical procedures, such as eyelid surgery or blepharoplasty, in which the surgeon removes excess skin and fat from lower eyelids. This type of surgery is rarely covered by health insurance plans, unless puffiness is recognized as a health problem. As for the home remedies, the most popular one is to apply cold compresses or slices of cucumber on the eyes. Getting enough sleep, sleeping with the head slightly elevated and reducing allergy symptoms also help. Could allergy have caused swell under my eye?